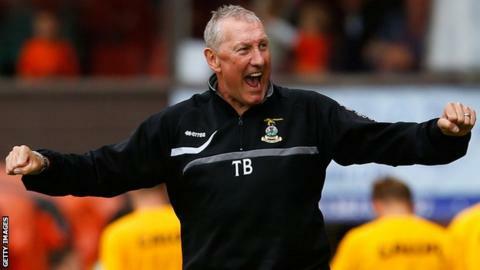 Terry Butcher's appointment as Newport County manager will be welcomed by most supporters, says the club's former captain and coach Jason Perry. Former England defender Butcher, 56, succeeds Justin Edinburgh, who left to take charge of Gillingham in February. "It's one that may excite the fans simply because it's Terry Butcher the player," Perry said. "He's got a lot of experience in management, some good, some not so good but... you learn from your mistakes." Butcher has been out of work since being sacked as manager of Hibernian in June 2014. He has also had spells with Coventry, Sunderland, Motherwell, Brentford, Sydney and Inverness Caledonian Thistle. "Any appointment is a risk of course and hopefully those who have appointed Terry Butcher have looked at that to minimise that risk, and looked at somebody they feel can bring short-term success but also build," Perry, 45, said. "It will help lift the profile of Newport because of Terry Butcher, and the second part I think is he knows the Scottish market. "A lot of clubs in the English leagues now are going over to the Scottish market because there's less money, bringing in young football players who have a lot of experience playing over there, a lot of game-time. "There's a lot of pluses to it but only time will tell if it's the right appointment." Caretaker boss Jimmy Dack will oversee Saturday's match at home against Oxford United, but then Perry believes the hard work will begin for Butcher as he overhauls the squad. "There's a lot of players out of contract and a lot of things have gone on behind the scenes, there's one or two may not be happy," said Perry, who played for clubs including Cardiff City, Bristol Rovers and Hull City. "Of course some of these players may not have the same contract that they've had this season, they may be asked to sign on for less and players usually go away. "I'm sure Terry Butcher will have a certain way of playing; he needs to bring players in that fit into that system - young, hungry players. "He will keep certain players, he's already watched the team, he's run his eyes over what he feels will be players that can help him in the changing room and on the field. "But some will go because he feels they're not right for Newport and others will make the choice themselves that they want to leave. "So it's a big summer ahead and I think there will be a lot of ins and outs at Newport County."